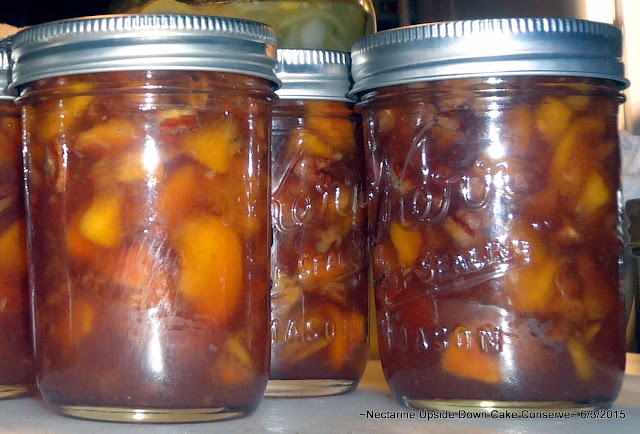 Nectarine Upside Down Cake Conserve - Canning Homemade! During the start of this canning season I have had the pleasure of seeing some new faces on my FB page. They are sharing their work and telling me that its been a long time since they have canned anything but now are jumping in with both feet. Many have had experiences with their grandparents that left lasting memories and back in the kitchen with that mental picture has given them some new found calm and peace. Many in my family don't get why I do so much canning and for hours on end. I have been late to this craft being in my 40's when I started. It's never to late to start but the family wants to know why. I guess my thought is it gives me that calm and peace when I am canning that I can't find anywhere else. It's not cooking for me where in the end someone will sit down when I'm done and in no more than twenty minutes it will be gone. It's a sense of accomplishment that I didn't waste, I can provide for later, and the pantry tells me that my family won't go hungry when times are tight. I know that many of you come to Canning Homemade strictly for the recipes. Some don't even read the stuff above the name of the recipe. It's important for me to remember to reflect on those that contribute so graciously, their stories, their recipes, and the hope of sharing with others not just in the US but around the world. Elizabeth's story is just like many others. She has been away from canning for some time and forgot how much she enjoyed it. She has fond memories of canning with her grandmother and now contributes her story through her jars with Canning Homemade and SB Canning. This is Elizabeth's Nectarine Upside Down Cake Conserve. Remember a conserve is a recipe with some kind of nut added. It looks delicious and really like the idea of the extracts adding some interesting flavors to the final product. Thank you Elizabeth for sharing your work and your story! Preparation: Prepare 8 half pint jars in hot water. Prepare nectarines by pitting, then quartered and slice. Add 4 lemon juice and orange juice, and let the mixture sit for a couple of hours. Cooking: In a stainless steel pot add nectarines and 1 cup sugar and heat over medium for a strong simmer. Cover and let simmer for 5 minutes. Combine ½ cup sugar with 6 T. Ball Pectin and stir into fruit. Bring it back to a simmer and then stir in the remainder of white and brown sugar. Bring the mixture to a hard simmer and cook until the recipe sheets off a metal spoon. Add the vanilla and butter extract. Remove from heat and gently stir in the nuts and fill jars.